With a Hurom, it is easy to maintain a daily healthy juicing habit. I happened to get hold of a brand new Hurom Juicer of the latest model (launched in the USA in June 2016), the Hurom AA Series, a.k.a. the Hurom Alpha series, not to be mistaken with the Alpha Juicer that is a horizontal slow juicer (one of my best sellers, but only available in Malaysia). In the horizontal single gear juicers category: The Omega J8003/J8005, one of the oldest and most solid models, always a winner and has never let me down in any way. In the vertical single gear juicers category: The Kuvings Wide Mouth Slow Juicer, another best seller due to its 3-inch wide mouth that is able to take in a whole small apple, thus reducing preparation work. In the twin-gear juicers category: The Green Power Juicer, produces the best juice quality and yield that is unrivalled by any other juicer. There are so many slow juicers in the market now, and there are only very few that I recommend. You can read more and see my other recommended models here. If you’re looking to invest in a new juicer, it is foremost important to understand what a slow juicer is. It is known by other names, such as gear juicer, masticating juicer or cold-pressed juicer. 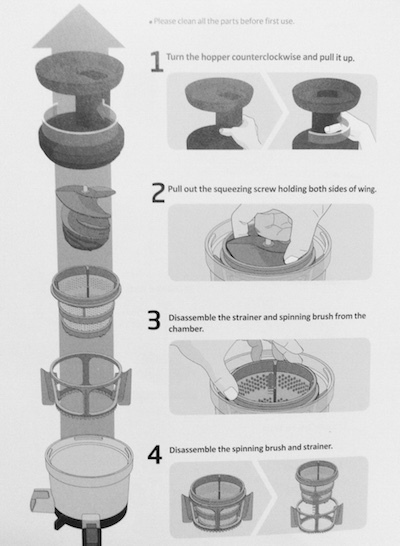 On this page, I will refer to the Hurom as a vertical slow juicer. The name “slow” is given because of the low RPM of the gear operation for juicers operating at 120RPM and below, versus centrifugal juicers that spin at a high speed from 3000RPM and above. The RPM speed plays a big role in determining the quality of the juice but there shouldn’t be an obsession to buy a juicer at the lowest RPM speed. For example, the Green Power Juicer operating at 120RPM produces a much better juice quality as compared to a Kuvings that is operating at 60RPM. The total makeup of the juicer, the type and size of gears, all play a role in producing quality juices that don’t oxidize so quickly. There are many pros and cons, but the key does not lie in the RPM alone. 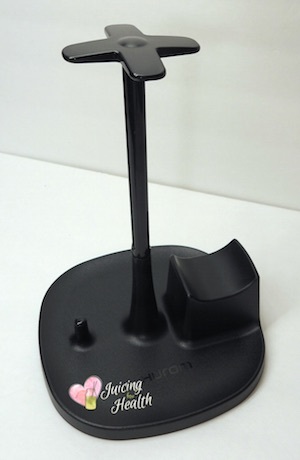 This Hurom AA series operates at 43RPM. 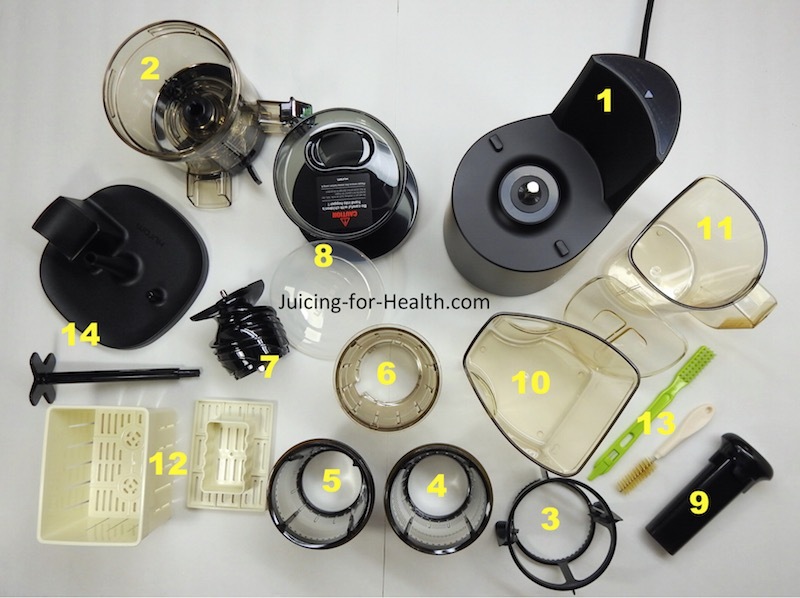 Having used another vertical juicer before, I noticed a few extra parts that come with the Hurom AA juicer. I like that the hopper and juice container come with lids. Hurom provides two juicing strainers with this model—you have the option of using the coarse or fine filter. I would most likely use the fine strainer more as I prefer my juices without pulp. There was also another strange-looking thing which I couldn’t figure out until I checked the manual. #14 in the image above and on right below, a chamber rack is provided for resting the auger, juicing chamber and the hopper. 1. Tofu Mold Set: I was a little surprised to see a tofu mold set in the box. I have no idea how to make tofu but looking through the recipe book that is included, there is a recipe on how to make tofu using this juicer. The recipe book also includes many different juice combos, smoothies, ice-creams and sorbets. Closed mode when in use to allow for maximum compaction, thus pressing out more juice/nutrients. Half-closed mode to release the pressure in the chamber for easy opening of the hopper when done juicing. Absence of this lever has caused many problems with other vertical juicers where the hopper gets jammed after juicing. Open mode for easy and convenient cleaning of the chamber. The older models just have a piece of rubber that is removed by pulling at it, without the handy lever. 3. Two Strainers: Many vertical juicers still come with only one strainer and one ice-cream/smoothie maker. 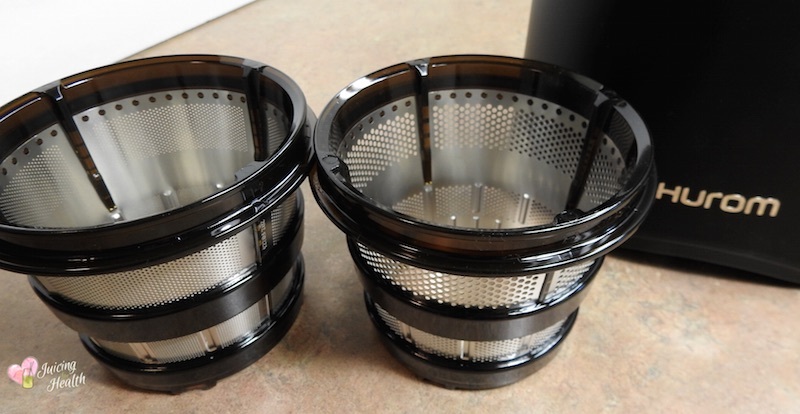 Hurom AA comes with the ice-cream maker, and TWO strainers—coarse and fine. You can use either one depending on what you juice, or your preference of whether you like pulp in your juice. 4. Non-drip smart cap: Smart caps are not new with vertical juicers. Most newer models have it. Nonetheless, I just would like to mention here, how I like the neat look of the smart cap and the fact that it is a non-drip. The cap is useful for mixing your juices, for when you juice a few different ingredients at a time, or when making smoothies. It also comes handy when you are done juicing, and can pour water into the juicing chamber with the smart cap closed for its self-cleaning feature. The diagram on the assembly instruction in the manual is a 4-step assembly but don’t let the chart intimidate you. Once you get used to it, it is very easy to put them together or to take apart. When you’re done juicing, the parts can be easily just rinsed under strong running water. The only part that may require a little extra effort to clean would be the strainer, using the brushes provided. As mentioned above, the control lever at the bottom of the juicing chamber is useful for easy cleaning. Just put it under running water and you’re done! You could also use the self-cleaning feature to save you time. As with most high quality slow juicers currently in the market, the auger is made of GE Ultem material that is said to be 8x hardier than polycarbonate material. It is heat resistant which is important, to withstand heavy-duty juicing and continuous contact/friction with food. The hopper and juicing chamber are made of non-toxic, food-grade, BPA-free material that is completely safe for daily use. Even after juicing foods with strong odor like garlic, it does not leave the odor behind after a simple rinse. While juicing, you may clean the juicer between different ingredients to wash off the color, taste and odor of prior juice. Do this by closing the smart cap, pour water into the juicer through the chute and let the juicer run for a few seconds. Turn it off, and open the cap to allow the water to flow out into the jug. Discard that water and start juicing your next food item. For the purpose of review here, I prepared my usual favorite ingredients so I can know roughly how much juice to expect, the color, the taste. It didn’t disappoint. 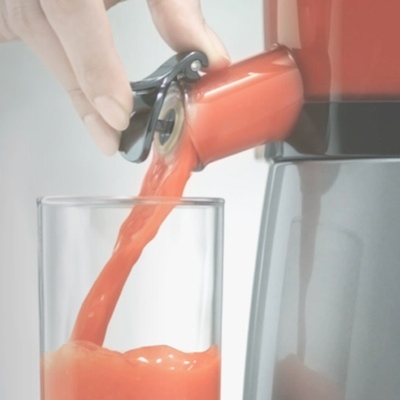 Although this is not a wide-mouth juicer, the chute opening is still big enough (about 1.5-inch x 1.75-inch) that it doesn’t require cutting the produce into very small pieces. As seen here, I need only one cut lengthwise, on carrots and cucumbers. Kale can be fed one stalk at a time. The manual instructed that celery needs to be cut into 3-inch sizes due to its fiber. I didn’t, but just cut the length in two. This saved me a lot of prep time. This juicer doesn’t always self-feed like the Kuvings Wide Mouth, but a little gentle push with the pusher did the job nicely. 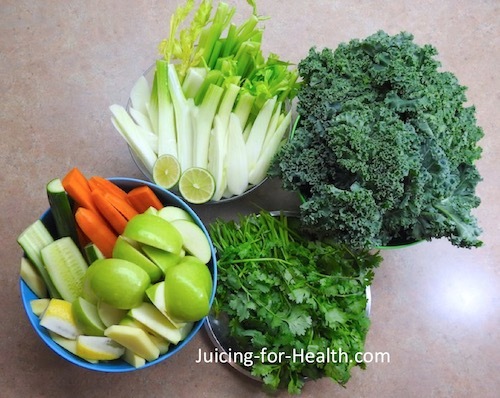 The pusher is necessary when juicing leafy greens like kale and cilantro. In reviewing a juicer, I usually look at the juice quality, how dry the pulp is, whether there is any wastage that gets trapped in the juicer. Other things to note are the ease of assembling and dismantling the parts, and finally, the ease of washing up. One of the first things I do when reviewing a juicer is to see how it extracts apple juice—whether it gets oxidized, or how fast it would get oxidized. I was rather impressed with the smooth, green juice result which was very sweet. This immediately got my approval, although the pulp was not super dry as I would like it to be. It was still acceptable. I am fine with a few drops less juice, in exchange for a rich apple juice that doesn’t immediately oxidize. It stayed fresh in the fridge, unoxidized, for a few more hours. 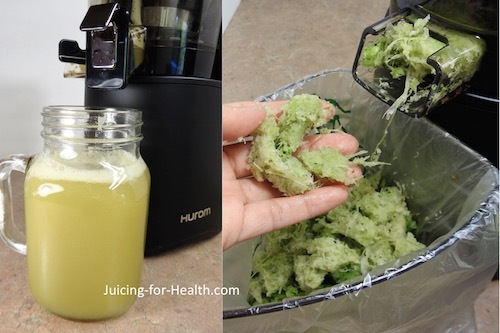 Another tough test that this juicer has to pass, is to extract juice from small leafy greens. Ideally, I would like to see how it does wheatgrass but I couldn’t get hold of wheatgrass at the time of review, so I used cilantro leaves instead. Not many juicers can extract cilantro easily but this one did. Next, I juiced kale, celery, fennel, carrots, lemon and ginger. The Hurom expelled reasonably dry pulp. If you want even dryer than these, you will have to go with the higher range, Green Power Juicer or Norwalk Juicer! This Hurom AA Series is one of the few vertical slow juicers that I have used. From the few points I mentioned above in this article, there are certain things that I really like about the juicer. As I always say, there is no perfect juicer. Every juicer has their pros and cons, and it depends on your expectations on what type of juicer you would like to have, and what is acceptable to you, or not. Small footprint with modern, curvy design that is both aesthetically pleasing, and functional. I usually leave the body/motor of my slow juicer on my kitchen counter, so, one that saves space and looks good is an important factor for me. Low RPM, low whirring sound while in operation, not noisy like centrifugal juicers. Big enough chute opening (although wide mouth like the Kuvings would be awesome!) saves preparation time. Love the neat, non-drip smartcap that serves a few purposes, including self-cleaning. Able to juice small leafy vegetables—definitely a plus! Able to juice green apples without oxidizing. Juice was able to stay fresh for a few hours in the fridge. Food-grade, non-toxic BPA-free parts that don’t retain odor, although this is a standard with most new and quality slow juicers. Almost dry pulp, good juice yield and juice quality. Have many parts—may be intimidating for a beginner, but you get used to it. Not all parts need to be used all the time. Washing up may be a little cumbersome, like all vertical slow juicers with bulky parts when taken apart. Considering all the good features of the juicer, the Hurom H-AA is priced to be a top range juicer, and this particular model is expected to be Hurom’s next best seller. 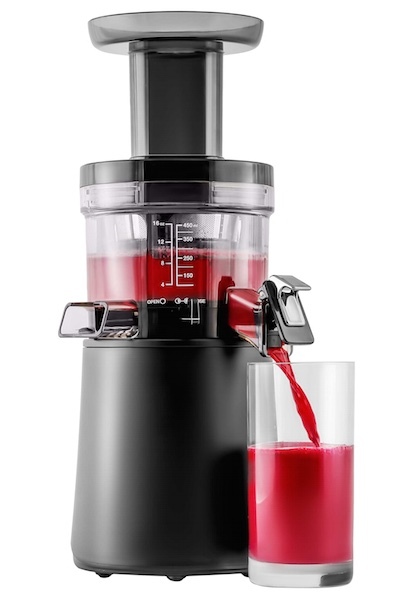 If you like the benefits of this juicer as I appended above, have the budget to spend, and space to store, then you just might like this new Hurom. If you like something that is a little low budget, easy to use and operate with few parts, go with the most basic Omega J8003 or J8004 that still does the job well. Or, check out my other recommendations. Maximum Use: 30 minutes continuosly. Stop for 10 minutes then continue. Warranty: 10 years warranty on motor, 2 years on parts. Hi Sara, I’m going to get this juicer very soon as well 🙂 I like the black with the gold lining.